My new favorite flight itinerary from Buenos Aires to Houston is with Aeromexico. It's been the most affordable option I've found this year, and best of all, it includes a 13-hour stopover: a full day to explore Mexico City from 7 am to 8 pm. I'll never say no to that. So far, I’ve used this Aeromexico route to explore Mexico City twice, once to explore downtown (read about that here), and again to experience all the fun things to do in Coyoacan. Mexico City is making me fall in love with it, one layover at a time!! Here is how we spent our one day in Coyoacan including a map at the end so you can copy our self-guided walking tour! After a long flight, we started our day with a relaxed breakfast at Los Amantes. I had been dreaming of chilaquiles and yelp directed me to this cute cafe. Coyoacán was a sleepy little neighborhood. It felt a lot more like being in a small village rather than a neighborhood in one of the world's largest cities. After a lot of delays at the airport, we didn't get to Coyoacán until around 9:30. However, the neighborhood seemed to still be asleep. It felt like a sleepy Sunday morning rather than a Wednesday morning during business hours. It is much more festive and crowded during the weekend. 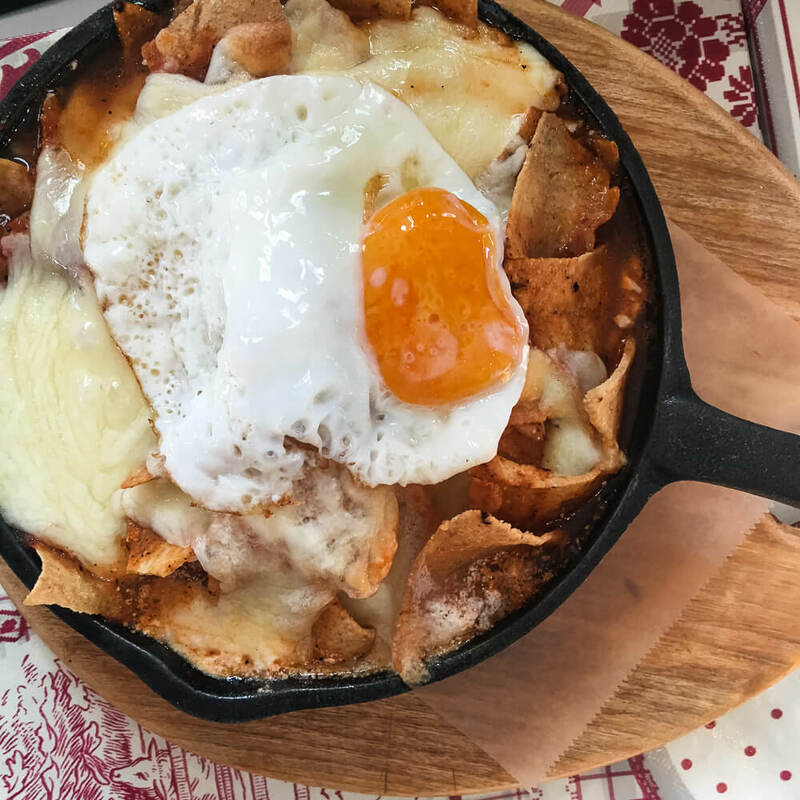 While the rest of Coyoacán woke up, we enjoyed delicious chilaquiles and migas. There are two main plazas in Coyoacan, located one right next to the other. Jardin Hidalgo is the neighborhood's main square. 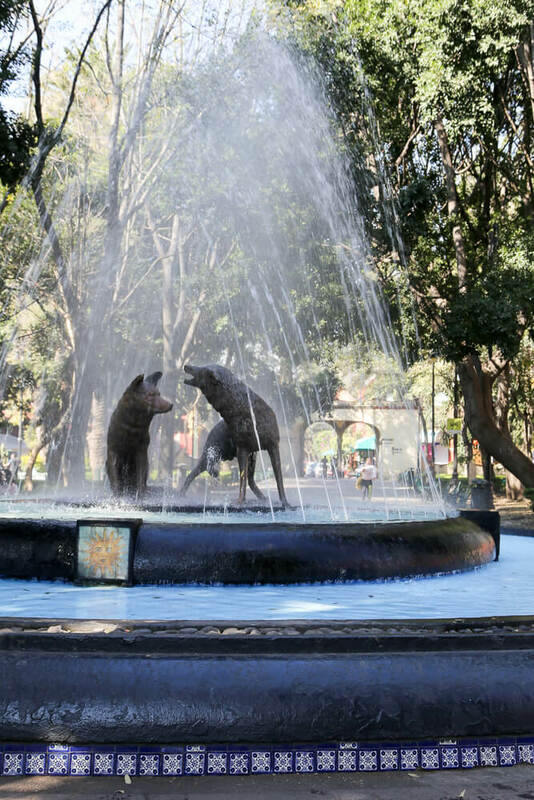 There's a fountain in the center featuring a couple of snarling coyotes (Coyoacan means "the place of the coyotes"). Just across the street is Jardin Centenario. It was originally part of the atrium of the San Juan Bautista Parish. After a stroll through the plaza, take a peak in the San Juan Bautista church. This parish is one of the oldest in Mexico City. The land was given to a group of Franciscan monks by Hernán Cortés and the church was built between 1522-1552. 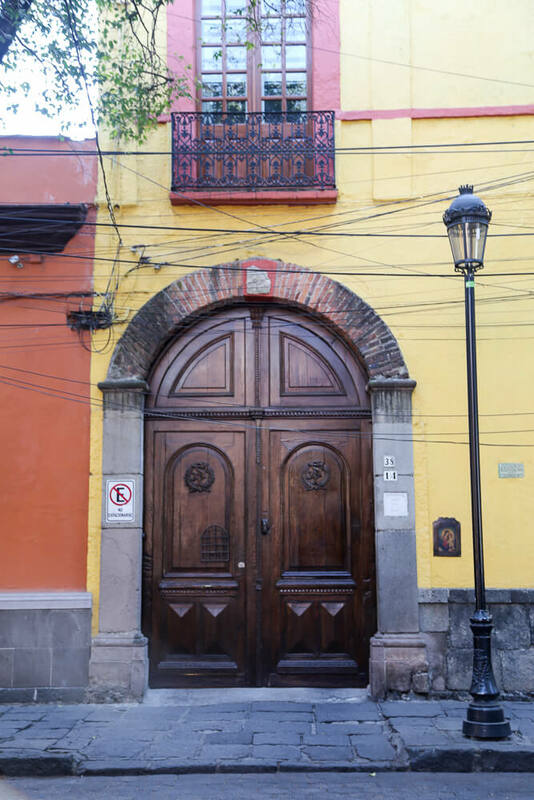 The architecture is a blend of baroque and colonial styles, however much of the interior has changed since the 16th Century with recent remodels and repairs. 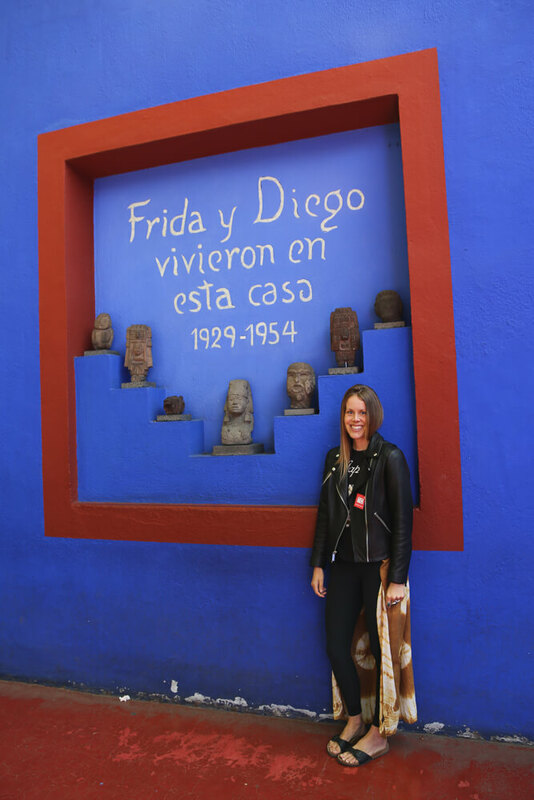 After relaxing in the plazas and watching Coyoacan slowly come to life for the day, we made our way to the Frida Kahlo Museum. Reserve your tickets ahead of time to avoid a long wait, click here to reserve. Tickets are 200 pesos each for general entry (around just U$10). It's free to take photos in the patio area outdoors but if you want to take photos inside the museum itself you need to pay 30 pesos extra. You can pay for that in the bag check room, where you leave any large bags and backpacks for free while you tour the museum. After about an hour of admiring Frida, we walked a few blocks to the Trotsky house. After being exiled from Russia in 1929, Mexico offered him refuge in 1937. 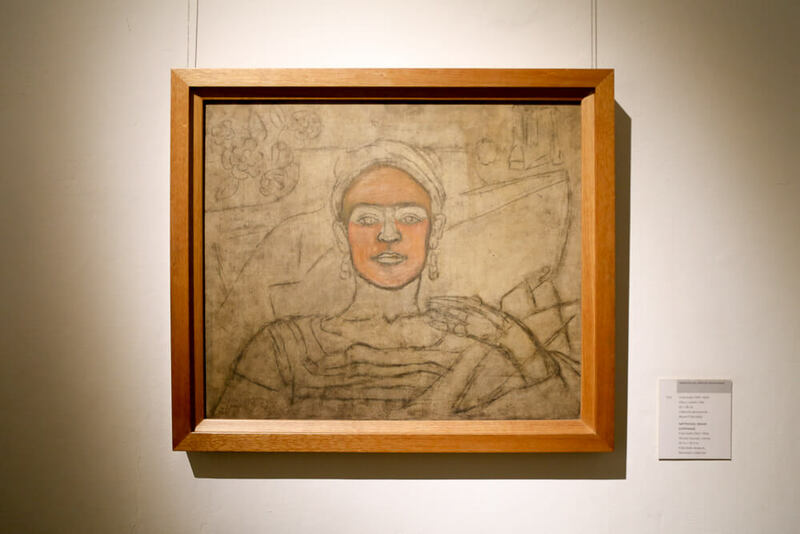 Leon Trotsky and his wife Natalia lived with Frida Kahlo and Diego Rivera until a fall out between them led him to buy his own home, but he didn't go far. He survived a couple assassination attempts and bullet holes from one litter the walls of his bedroom. Eventually, he was killed by a GPU spy that had infiltrated his social circle. Before our trip, we watched "The Chosen", a movie released in 2016 about his assassin. It definitely made the visit more interesting having seen the movie the night before. You don't need to reserve ahead of time for Trotsky. Just show up and pay the 40 peso entry fee. If you want to take photos the cost of permission is 15 pesos. After the museums, it was time for lunch. We walked to the Coyoacán Market to eat the famed Tostadas de Coyoacán. Explore the market, buy spices and mole and stock up on tropical fruit. Then make your way to the center of the market and find the yellow signs advertising the original Tostadas Coyoacán. The Tinga de Pollo was amazing, and the seafood options are supposed to be very good as well. After a filling lunch, start walking back towards the main square, stopping for a coffee at Café El Jarocho. The coffee shop has been open since 1953 and is family run. 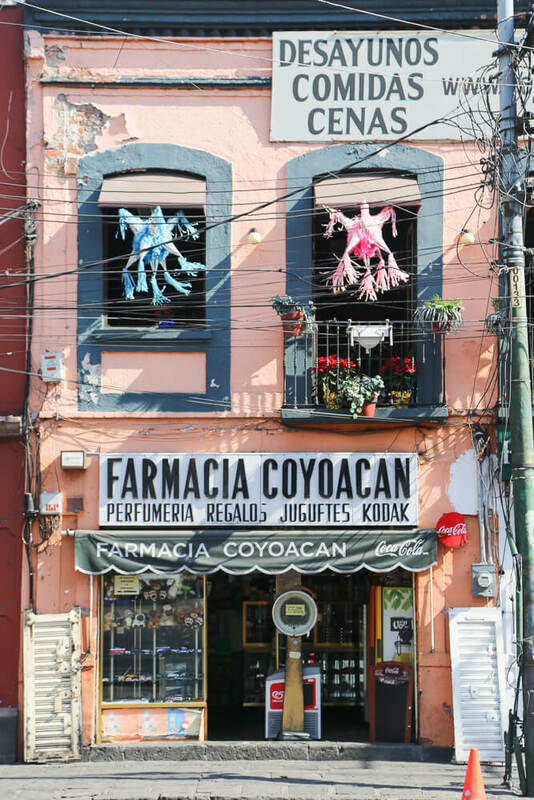 There are more locations throughout the city but the one in Coyoacan is the original. I had seen everyone walking around that morning carrying the same coffee cup, and it refreshingly wasn't from Starbucks. It was from El Jarocho. It was a nice rest break to sit for a while with our coffee on one of the benches along the sidewalk. Circling back to the main square, we shopped at the Artisanal Market located across the street from the Jardin Hidalgo. I wasn't really impressed with this market but they did have some beautiful things. However, I found most of it to be cheap and mass produced. I preferred the Ciudadela Market downtown. Leaving the market we walked back to the Jardin Centenario, said hello the coyotes again while crossing the square. We left through the arches at the other end of the square to walk down Avenida Francisco Sosa. It's a beautiful tree-lined avenue lined with traditional, colorful homes. We walked a few blocks to the Francisco Sosa Park and admired the Iglesia Santa Catarina. Located at Francisco Sosa 202 and on the plaza of the Francisco Sosa Park is the Jesus Reyes Heroles Cultural Center. The center is named for the recognized historian and political scientist. We relaxed for a while in the beautiful interior patio and took pictures with our friends Frida and Diego. We had a tour reserved at 4 to tour the Luis Barragan House & Studio. So at 3, we sadly had to end our day in Coyoacan and take an Uber across town. I don't have any photos of the Barragan house because it costs 500 pesos to be able to take pictures inside. And that was just too rich for my blood (taking pictures costs more than twice the cost of the tour!). I can't recommend the tour enough. If you have any interest in architecture or design you'll love the Barragan house, but make sure you book in advance. This isn't in Coyoacan so perhaps I shouldn't have even bothered writing about it here, but the tacos we ate afterward deserved mention, so forgive me. After the Barragan House, we walked into the first taqueria we saw. I wasn't leaving Mexico City without eating some Tacos al Pastor. After we had our fill of 3 peso tacos (3 PESOS! ), we took the Mexico City Metro (which was an experience all in itself!) back to the airport for our 8 o'clock flight to Houston.